When bedroom space is limited and you need a useful space which includes a bed, your other option is to build a loft bed. It is in fact a type of bed built in such a way that you have ample space beneath the bed to utilize. You can either add another bed, place a study table or workstation; make it a storage space, or even place a sofa to lounge in. These are just some of the useful possibilities of the space beneath the bed. To build this bed, some of the tools you’ll need include lumber posts, plywood, lumber board, screws and bolts, ladder, saw and drill. There should sufficient ceiling space above the bed before you start building. 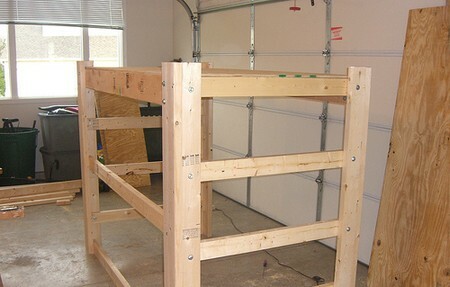 Here are some of the ways on how to build a loft bed. Firstly, the lumber should be cut into a size of approximately 2×6 feet. Then, create a rectangular box. This will be the frame. Remember to take into account he size of the mattress. Create a frame that will fit the mattress. From two pieces of the earlier lumber, cut them into six and a half feet piece each. The rest of the lumber should be cut into 37 inches length. The box should have a measurement of approximately 40x78x5 inch tall. The plywood should be measured and cut to fit the box. Then, it is screwed to the box at every 2 feet interval. Now, it is time to create the posts. First, cut the 4×4 inch post into the same length. It is best to measure them again after you’ve cut to ensure that they have the same length. It should be tall enough to provide approximately 3 feet clearance away from the ceiling. Position the posts in such a way that they are parallel, and spaced approximately 78 inches apart. You will need two persons for this task because you have to tilt the platform and bring the plywood surface to tough the line on the post. The next step is to attach the platform by drilling holes to the posts. Use bolts for extra security. Depending on the height of the one using, you may also add ladder to the bed. Feel free to paint the finished project and remember to give it thorough sand so that the wood particles will not harm the one using. The ladder should be attached securely. These are the steps to guide you on how to build a loft bed. Remember to fully utilize the space beneath because that is the main purpose of such a design!